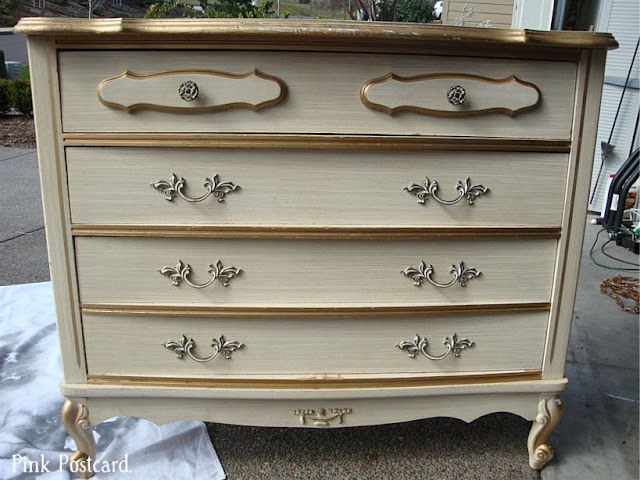 Oh, I have been scouting for a French style dresser for so long!! I was thrilled to find this a couple months ago and take it home! 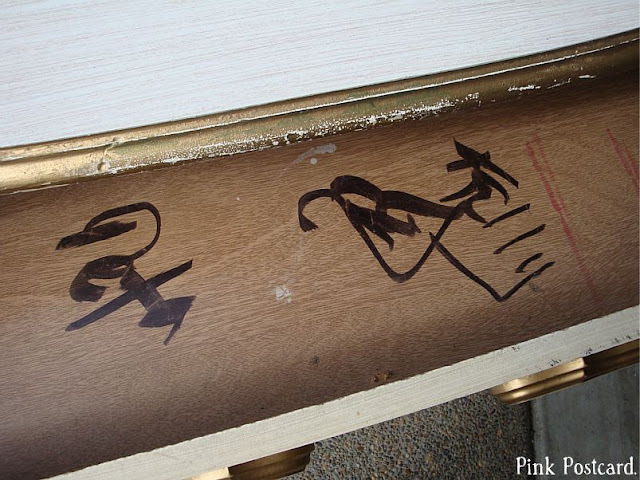 The drawers had some lovely graffiti scrawled inside. You can also see how rough the edges were. 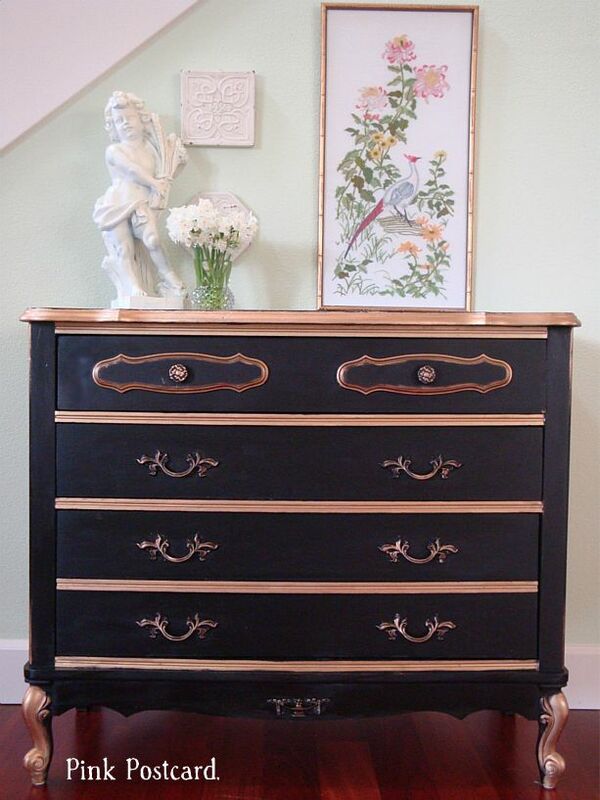 My furniture Pinterest board has a couple black and gold dressers that I fell in love with. I was so anxious to finally try and do one myself. This was also a return to latex paint for me. 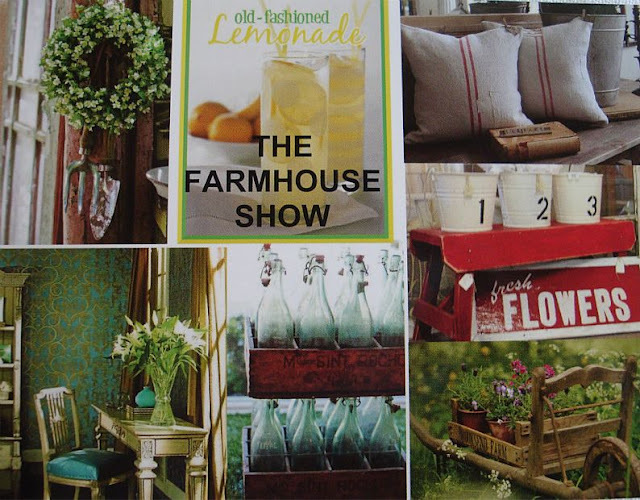 I've been doing so many projects with chalk paint lately- it's great for those of us in wetter climates- quicker dry time when the weather suddenly decides to be uncooperative. Annie Sloan paints don't have a true black. There's Graphite, but it tends to be more, well, graphite or charcoal in color. I needed a true black. I went to my old standby, Behr Premium. I love the test pots, because it is usually just enough for a single project, and it has primer in the paint. It's an affordable way to try out a color too. 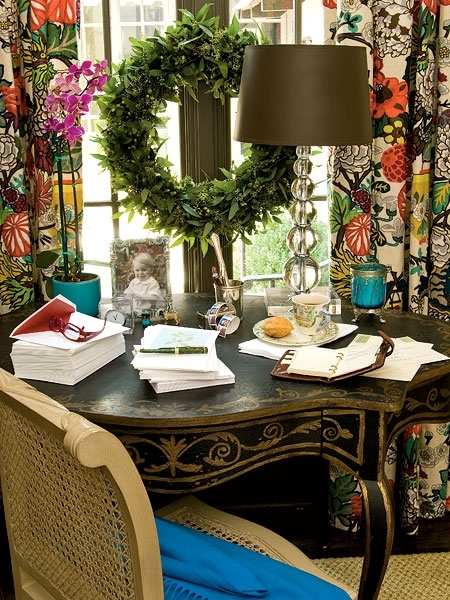 I love that this is such a traditional looking piece- also a departure for me- since I tend towards the Shabby Chic look. Once again, I looked forward to breaking out my Antique Gold Rub n Buff!!! This really enhanced all of the gold detail and it was so much fun to use. Like buttah I tell ya! It went on so smoothly and covered all the imperfections so well. You can find Rub n Buff at craft stores. 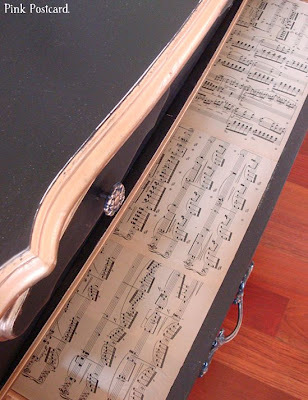 I also lined the drawers with vintage sheet music and Mod Podge. 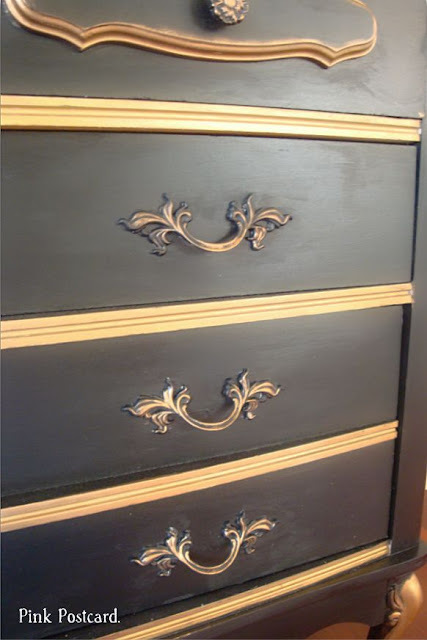 My French "Napoleon" dresser will be going into my space later today. I have a little corner of all French items- some linens, a metal three tier basket, "Boulangerie" sign, and some accessories! The Farmhouse Show in Turner, Oregon. Show will be restocked regularly! Mark your calendar, I hope to see you there! Oh Denise, how absolutely gorgeous! Aww I love the black and gold. It came out gorgeous! I have this EXACT same dresser, in the before state. My husband and I got it from our first landlords 3 years ago for free; I think they felt bad we were keeping our clean clothes folded in pop up laundry baskets. At first glance I thought of it as a cheap dresser from a super old Sears catalog (ours has a Sears sticker on it). I quickly realized that it has a little style potential. I've considered saving it to use in baby's room. The top two drawers are pretty shallow and would lend themselves well to little clothes. I think yours looks great, but for a baby room I will likely go for a less bold look. Do you have any good ideas for a softer looking redo on this one? it looks really really great. Oh Wow! 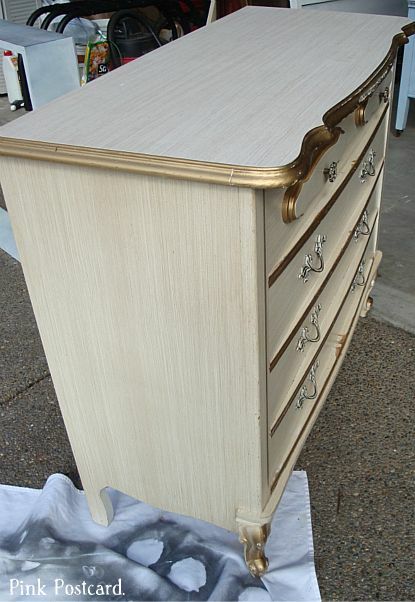 It's not even recognizable as "one of those" dressers. I love the black and the way you kept the gold...so rich looking and I'm sure it won't last long. I'd have a hard time giving it up. Denise that is beyond fabulous! Thank you so much for coming to party with us! 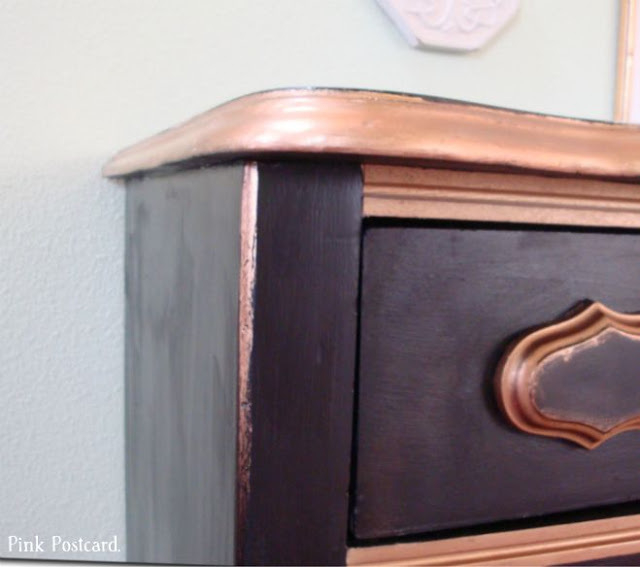 I know everybody will enjoy seeing your frenchy dresser! I know I did! That is one beautiful dresser! Great transformation! I have to admit that I was a little aprehensive when you mentioned black with gold gilding, but it looks so rich and fabulous! I love it! Nice work! I am inspired! 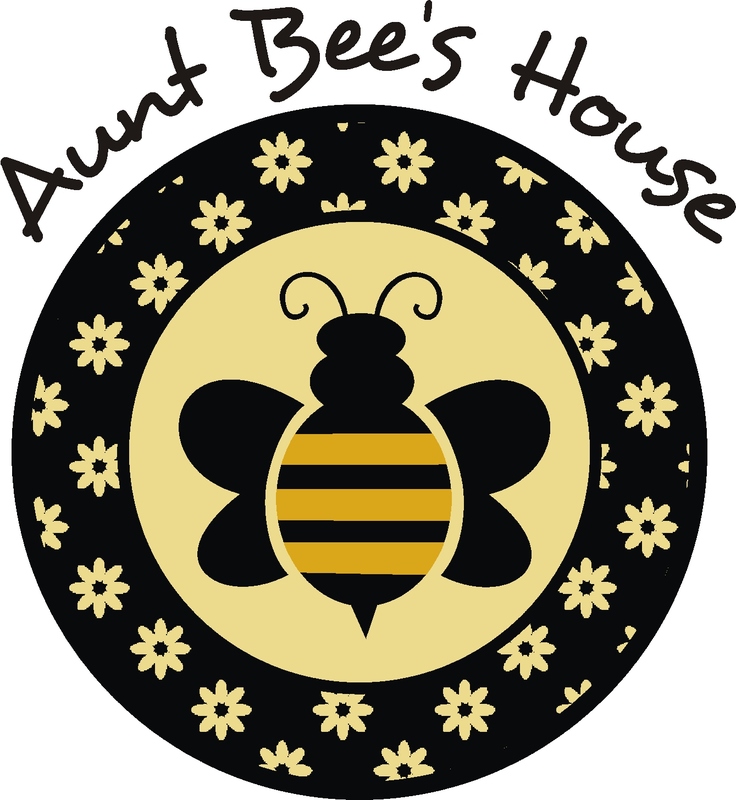 The dresser I picked up is from that same family of furnitue...same era, etc, but a slightly different shape I think. I really like this piece and I love how you explain the process. Love the black and gold. Wish I lived out there I would definitely attend.